Selling Your Twin Cities Home? RE/MAX agents sold more listings in the Twin Cities 13 county metro than any other brand in the business during 2014! That equates to more satisfied customers! 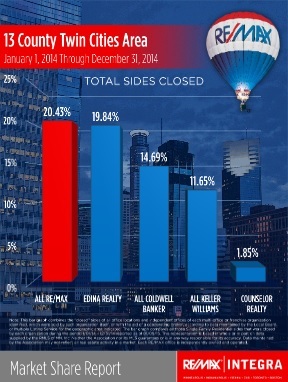 RE/MAX agents also was #1 in Total Sides Closed in the Twin Cities metro for the entire year of 2014. RE/MAX Results is the largest RE/MAX franschise in world with over 900 agents and 30+ Minnesota and Western Wisconsin Offices. Real Trends ranked the company as the 13th largest real estate company in the United States with over 4.5 Billion in Volume in 2013. Barker Hedges Group is proud to be part of RE/MAX Results, which has sold more homes per agent than any other real estate company in the US during its 40 Years in business. We are your local, RE/MAX Results Realtors and we specialize in the entire Twin Cities area. How is it possible to specialize in the entire Minneapolis and St. Paul real estate market? Our team consists of 20 highly experienced agents who each have an expertise in one segment of our local market. From Buffallo to Western Wisconsin and Cambridge to Faribault...we have agents who are ready to make sure your next real estate sale or purchase is financially fullfilling and hassle free. If you are interested in learning more about our services, please take a moment to complete the information below.